The type of Vampire that feeds on Dragon blood is in NYC. They want the American Dragon. Jake has a secret weapon but so do they! How can he defeat them at night and when he is too weak to blow fire? Jake must protect the trident while competing with his cousin. 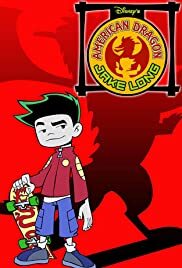 How many episodes of American Dragon: Jake Long have you seen? Jake Long: [Repeated line] Oh man! I disagree with a previous comment about this show. Yes, it is an anime wannabe, but maybe that's why it's sort of good. Instead of a plot less cartoon with nothing changing from episode to episode, there is character development and real confrontations. Now, this isn't the best show out there (I HATE the new animation style) but it's not complete crap. Jake Long is a little stupid & yes cocky, but that's good. How many main characters are completely caring & try to do their best? It's good to have a character who every now and then acts like a real kid. Children, I think, can relate to giving up something they want to do so, that they can be responsible. This show teaches without preaching. And yes, Trixie is VERY stereotypical. But I think the point is to try to show diversity - instead of a weak, token "girl", (& token black character) who is only there to show how "nagging" girls can be, Trixie is strong and intelligent- in other ways. She may not know "big words" but she understands the power of friendship & loyalty. She's in-your-face & sometimes just what Jake needs. What drew my attention was the difference in the characters and even the plot. You have to excuse the "fad" of trying to be something else (ie: Japanese) and see it for what it is.